There is a growing reliance on all health care workers to understand and practice economic evaluation. This comprehensive book written in jargon-free language provides a basic introduction to the subject. It succeeds in explaining both the principles of economic evaluation and how to use them. The second edition has been revised throughout and now includes a chapter on decision making, which explains the tools of systematic reviewing so bringing the book right up to date. 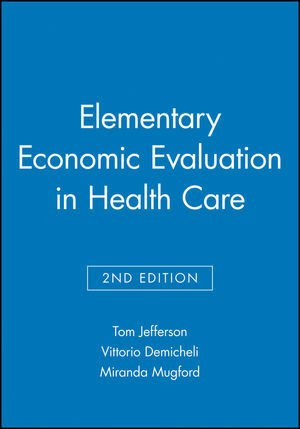 Tom Jefferson is the author of Elementary Economic Evaluation in Health Care, 2nd Edition, published by Wiley. Vittorio Demicheli is the author of Elementary Economic Evaluation in Health Care, 2nd Edition, published by Wiley. Miranda Mugford is the author of Elementary Economic Evaluation in Health Care, 2nd Edition, published by Wiley. The importance of economic evaluation. Economic logic - resources, margin, and opportunity cost. Economic logic and medical ethics. The expansion and evolution of health economics. 2. The basis of economic evaluation. Economic evaluation and clinical trials. Quality and peer review of economic submissions. Health economists' study group (hesg). Appendix 1 Costing methodology for any type of economic evaluation. Appendix 2 Economic logic applied to management of health services - forms of economic appraisal. Appendix 3 An introduction to health care decision analysis.